Ask that of a run-of-the-mill virtual assistant and it will probably not give you a useful response. Just basic, natural language processing is a beastly problem for artificial intelligence platforms to begin with, but accounting for niche slang, like online gaming jargon, makes it nearly impossible for a broad wide-reaching platform like Google Assistant, Microsoft’s Cortana, or Amazon Alexa. Sometimes, you need a specialist. 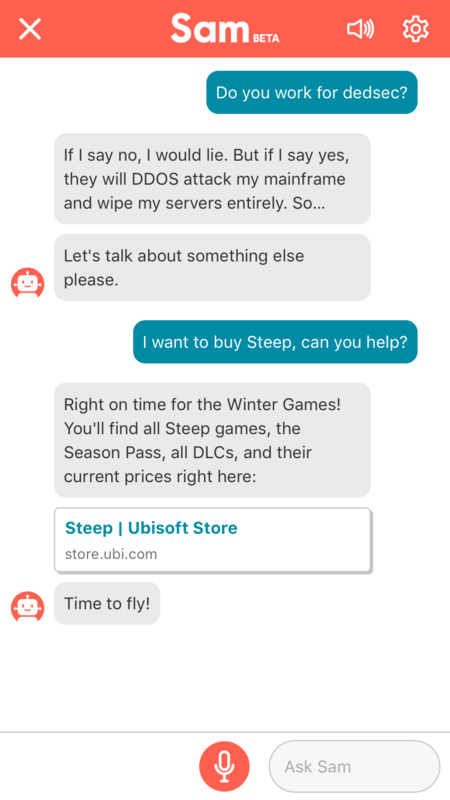 Sam is a new virtual assistant built specifically for gamers by Assassin’s Creed publisher Ubisoft in collaboration with Google Cloud. Sam leverages all of your game data and the publisher/developer’s expertise in its own products in order to enhance the gaming experience. When it launches in a Candadian-exclusive closed beta this week, Sam will be integrated into Ubisoft Club, the publisher’s rewards program that connects to the publisher’s games. The free, artificially-intelligent extension of the app lives in your smartphone, and can be engaged through both text and voice. Ubisoft Club is a multiplatform rewards program that tracks your gameplay data from Ubisoft titles, offers achievement challenges, and reward you with “units” that can be spent on in-game content for Ubisoft titles or for discounts from the store. Sam has access to that data, and can call up anything from that information you’d like to know. You can ask it about how much progress you’ve made in Assassin’s Creed Origins, or your kill/death ratio from your last Rainbow Six: Siege session, then you can ask it to compare your stats with your friends’. Sam also knows everything there is to know about Ubisoft’s games in general. Ask about the release for an upcoming game, like Far Cry 5, and it will tell you the date, show you the trailer, and link you to the store so you can pre-order. If you’re struggling with a particular section of Assassin’s Creed, it can direct you to a walkthrough video for that sequence. It’s one thing to have Sam answer questions when asked, but Huteau and his team are taking it further so “Sam should be able to push you useful information before you even ask,” Huteau said. The first (and thus far only) game to utilize this proactive approach is Rainbow Six: Siege. When you start up the game, no matter the platform, Sam pings you on your phone with a personalized message about your stats from the last time you played, and tips for how to improve based on that. If you prefer to play with a particular operator or weapon, or tended to struggle on a particular map, Sam will push a relevant guide from YouTube. The content that Sam pushes doesn’t come exclusively from Ubisoft, but is curated from its game communities to highlight their best work. The decision to rely on user-generated content came from the Rainbow Six developers when Huteau and his team first pitched Sam. Perhaps the most clever part about Sam is that its structure provides a natural and direct way to get smarter and more useful the more people use it. Users can up- or downvote any content Sam shows them, teaching it what people want. Asking questions is the main mode of interaction, so even if Sam can’t produce a useful answer the first time, the developers find out that what people want to know, and can give it an answer for next time. Huteau’s team regularly meets to look at the most frequently asked questions from internal testing to see how to best spend their energy in improving Sam. 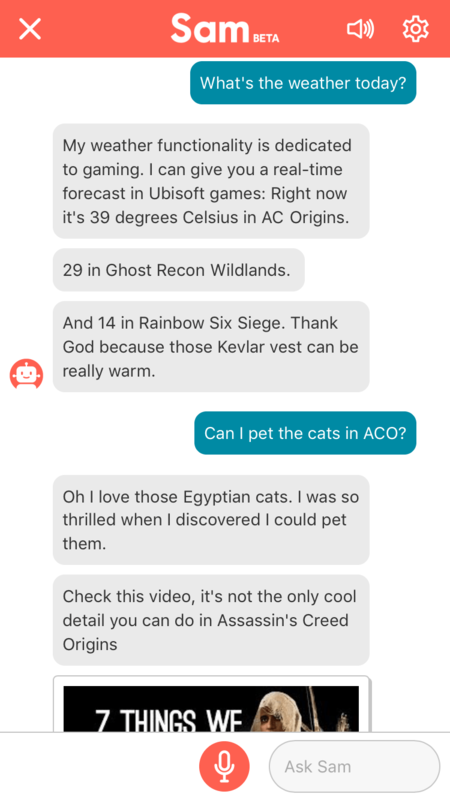 One example that came out of internal tests, for instance, was everyone asking whether you could pet the cats in Assassin’s Creed Origins. Sam is still in its early days, and where it goes next will depend entirely on what people ask of it. That said, Ubisoft’s launch trailer for Sam suggests that Ubisoft’s next step will be adding the ability to set up gaming rendezvous with friends for later, with push notifications, messages, etc. This reflects the Sam’s circular nature: Its potential to be something very interesting and useful, is contingent on whether people actually use it. A more focused, subject-specific virtual assistant is an interesting way to create a more useful project than attempting to do it all — it reflects the general divide in artificial intelligence research between the near impossibility of generalist, “strong A.I.” versus “weak A.I.,” developed to address narrow and particular problems. The biggest hurdle Sam will face, as we see it, is that it’s strictly limited to Ubisoft’s own library. For gamers that prefer depth over breadth, playing a few games extensively, it could be a great tool for enhancing their experience. For players with a more diverse gaming diet, however, Sam’s use cases might be too narrow. Regardless, it’s interesting as an experiment, and as a potential sign for how A.I. might enhance the gaming experience in the future. With its huge body of specialized knowledge, lingo, and conventions, gaming might be the perfect field in which to test this sort of subject-locked virtual assistant. Human-A.I. teams have already shown themselves to be the most effective chess competitors in the field, so the sky is the limit for empowering gamers with artificial intelligence.